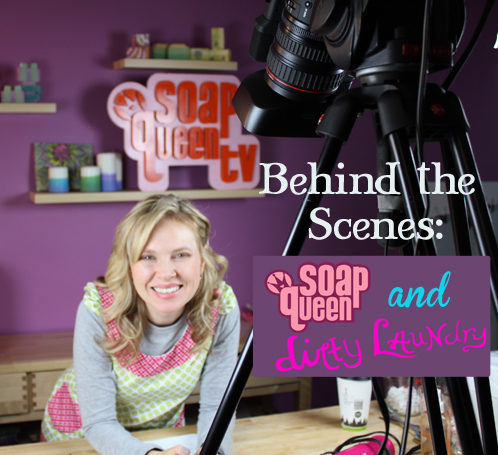 It was such a fun day on the Soap Queen TV set with our special guest, Jeanee from Dirty Laundry! She flew all the way from Miami to film with the Soap Queen crew. Flying from Miami to Bellingham meant flying through the night (! ), with two flights over 15 hours, and then getting in a car and driving 3 hours to our little ‘hamlet. Now that’s some (soapy) dedication! Can you say climate culture shock? Jeanee (pronounced Ja-Knee) was bundled up from head to toe trying to stay warm in the sideways rain and wind storm we had over the weekend. Thanks for the welcoming, Washington! We did step it up for her by debuting our brand new aprons (made here at Team Bramble Berry headquarters) but I’m not quite sure that was enough to make up for the rain. Jeanee has a graphic design background so she came up with a really cute box template to package up the desserty cube soaps that we made (that totally look like giant petit fours with sprinkles to boot). The box template is going to be an extra bonus for that episode of SoapQueen.TV that’s entirely free. It fits our cube molds perfectly. Jeanee also shared her bath bomb recipe and wowed us with her darling icing techniques. She’s definitely a bath bomb cupcake pro. 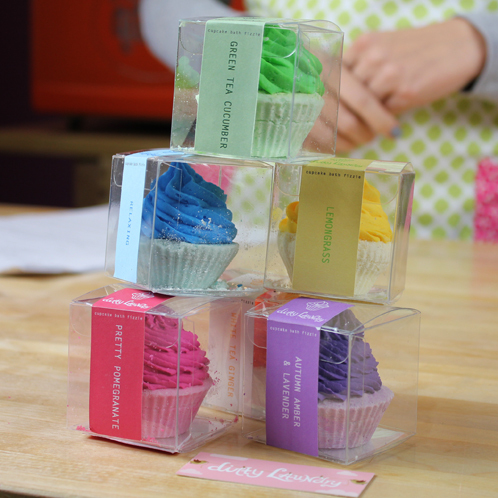 We made cupcakes with Clementine Cupcake, Lemon Cake and Chipotle Caramel fragrance oils. Do you get the theme that we were going for? I’ve never wanted to eat sugar more in my life. The Soap Queen TV set smelled just like a bakery. Be sure to check out Jeanee’s Dirty Laundry Blog. She’s all about style, beauty products and mini bath bomb cupcakes. Plus, she just added a few of her own photos from the trip so you can see the adventure from her point of view. 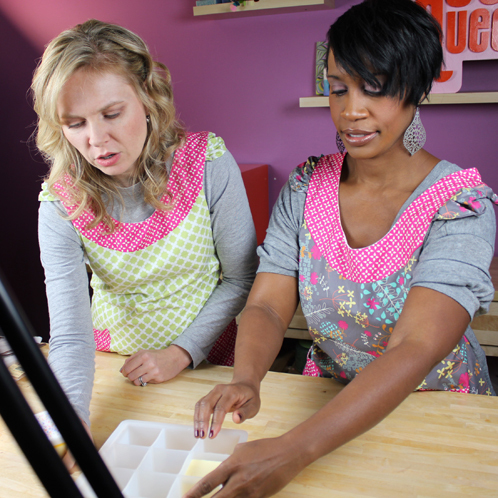 And you can follow us on Facebook to find out when this episode of Soap Queen TV launches. Jeanee’s icing techniques will take your bath fizzy cupcakes to the next crafting level and the soaps are simply adorb, adorb, adorb (what is that, adorb cubed?). You always seem to have so much fun filming those episodes. And I love the aprons, great splashes of colour. I noticed the aprons right away. Did you make your own pattern for it? I adore the colors you choose as well. She is one talented lady.